Do you have a child who dons a headset every night after school, shouts through it to their friends at an unbelievable volume, and has to be physically dragged away from the machine at bedtime? For those of you that don’t, Fortnite is a multiplayer shoot-em-up game, played via a variety of consoles, computers, and even phones, that involves the child playing a team game in which 100 players on a small island kill each other until only one remains. 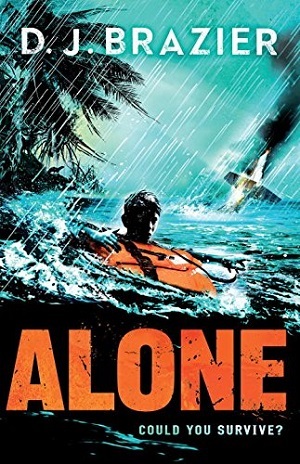 Sort of like The Hunger Games or Survivor, with weapons including crossbows and rifles, and a Minecraft element in which players can build themselves things (shelters) out of resources lying around. Unbelievably, it’s even popular to watch other people playing it, and there are various Youtube resources to do this. Many parents are decrying it – I recently had some parents complain that the kids were hurriedly completing all homework during break time at school so that home time was strictly reserved for Fortniting. Yes, I did just make a verb out of the name. Of course it’s irritating for both parent and child when they’re in the middle of one of the twenty minute games and you call ‘dinner’, but actually I’m rather liking it: it’s possibly the most social thing my son has done for some time. (Please note my son only plays with his friends not strangers – see the link above for safe internet guidance). But more than the social element, and here comes the books bit: the game is a narrative. 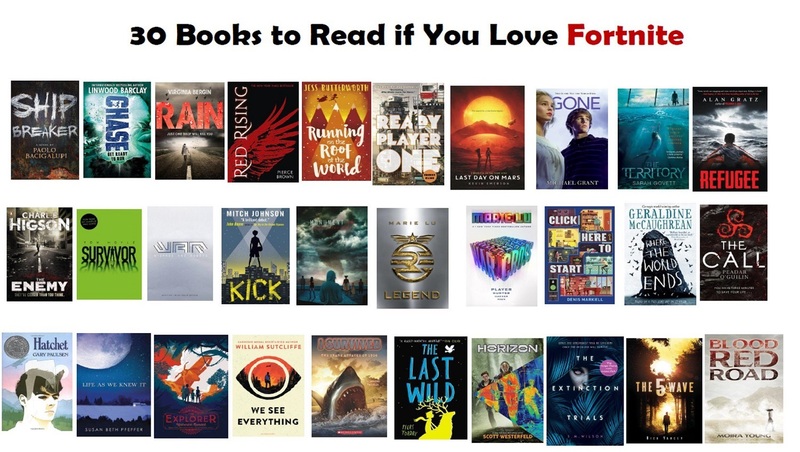 In fact, it grew out of an apocalyptic zombie game, and what’s more, one clever librarian, UK School Librarian of the Year 2017 Lucas Maxwell has put together a phenomenal list of books for ‘if your child loves Fortnite’, including Survivor by Tom Hoyle. The list covers a spectrum of age ranges – because the children playing are anything from 8 years to 99 years, so do ask if you’re unsure of content. 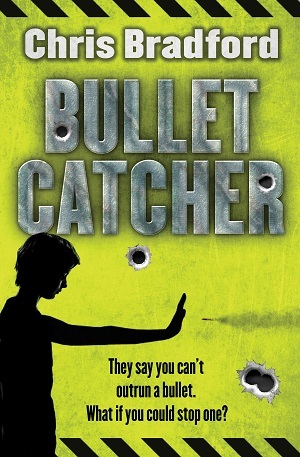 but I’d also add to the list: Alone by DJ Brazier, Runner by Tom Bowler, Lifers by MA Griffin, River of Ink by Helen Dennis, Blame by Simon Mayo, Urban Outlaws by Peter Jay Black, and Bullet Catcher by Chris Bradford. For a classic, try Lord of the Flies by William Golding. However, to step back to the game for a minute, I love the storytelling aspect of it. Unlike FIFA for example, which is hours of fake football, Fortnite is part of our storytelling world. Storytelling is how we make sense of the world around us. We even structure our own lives into stories to have our lives make sense – sometimes with huge embellishments (take any CV). Through family stories and fiction (including narratives on screen), children develop the ability to tell a story. And this is important because they learn the ability to identify how one thing leads to another – casual coherence, as well as thematic coherence – how ideas and tropes repeat and recur throughout stories. 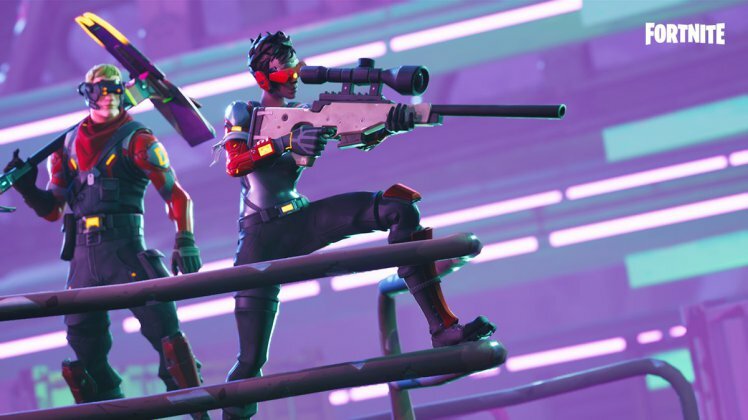 By telling these stories – by children bouncing the narrative of their Fortnite games off each other – they make connections between different points of information in the story. They strengthen their ability to tell a story, and build their sophistication in narrative, for example, building anticipation. In fact, there are a whole host of Youtube and gamers’ narratives around Fortnite – in which people become engrossed in their avatar’s behaviour and story during the game – you can seek certain storylines such as ‘a story of revenge’ and so on. Even more fascinating is the bigger narrative surrounding the game. There are theories that the game makers have layered in different elements – such as that the idea that the island is like a map of Poland, and if you superimpose one onto the other then there are parallels between the two. Other theories include the idea that random vibrations on the console itself are a kind of Morse code, conveying messages to the player. Whilst I’m not proposing to spend a great deal of my time investigating these stories, it’s fascinating to hear gamers discuss the different options and opinions – forming their own stories around the way they play and what they think is happening. The game makers are having fun with the story, in the same way that an author sews patterns and rhythms into their novels, laying clues and narrative threads. Gaming can give you a similar immersion in a narrative as books. I’m not advocating that children refute books for the thrill of Fortnite. However, if they use the game in moderation, and we make it a gateway to understanding narrative – then we can feel slightly better when they disappear for hours in front of the screen. All you need to do is promise them one more game, if they then go and read a book for 20 minutes. And now you have a book list that fits the purpose. And while some are playing Fortnite, there is another cohort of children playing with slime. Some great stepping stone books for them would be Home Lab by Robert Winston, including a recipe for slime, but also using rubber bands to build a Solar System, ideas for wind catchers and more. Or This Book Thinks You’re a Scientist, Rosie Revere’s Big Project Book for Bold Engineers, the Self-Destructing Science Series, and How to Make a Universe With 92 Ingredients. The Fortnite image is taken from Epic Games.